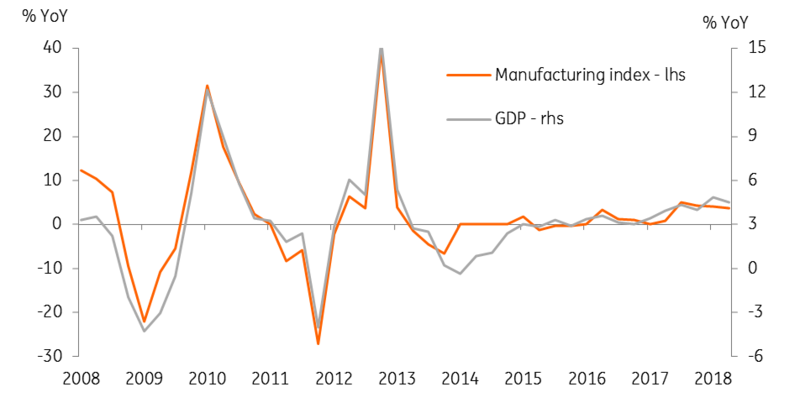 Thailand’s activity data for the second quarter of 2018- the June manufacturing and current account balance- surprised on the upside, signalling that it was a better quarter for GDP growth than we expected. While the government agencies, the finance ministry, and the central bank, have been upgrading their growth forecasts for 2018, we retain our 4% forecast for this year. Absent central bank (BoT) policy support, and with weakening external payments, the Thai baht (THB) should continue its depreciation trend for the rest of the year, although with some stabilisation in July. June industrial production (IP) growth came in at 4.7% year-on-year, well above the consensus forecast of 3.1% and up from 2.9% in May, although growth in the previous month was revised from the 3.2% initial estimate. The low base effect and firmer export growth explain the better manufacturing performance in June. This puts average IP growth in 2Q18 at 3.2% YoY, a modest slowdown from 3.7% in 1Q18. IP growth closely tracks real GDP growth (see figure). We now estimate 2Q GDP growth of 4.5%, up from our previous forecast of 4.0%. Data for 2Q GDP is due on 20 August. We maintain our full-year 2018 growth forecast of 4.0%, as evolving risks of the global trade war will weigh on exports and GDP growth in the remainder of the year. Earlier this week, the finance ministry lifted its growth forecast for 2018 to 4.5% from 4.2%. The central bank's forecast is 4.4%, recently revised from 4.1%. 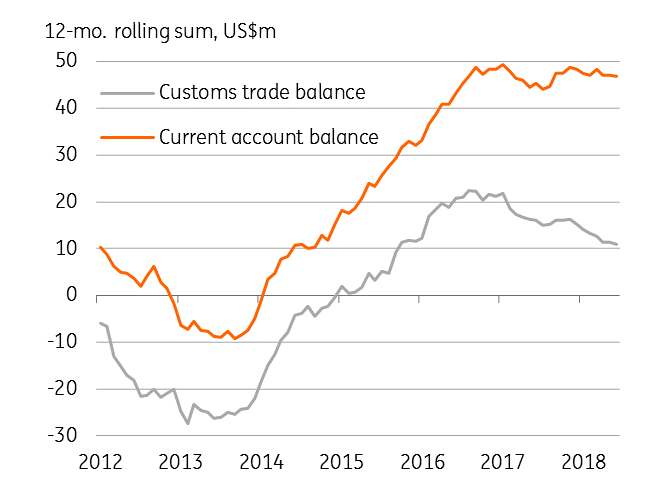 The balance of payments data for June showed a bounce in the current account surplus to $4.1 billion from $958 million in May. Most of the bounce was from the services trade, especially tourism-related income, while the goods trade balance was only slightly better at $2.9 billion than $2.7 billion in May. A large positive swing in the current account was accompanied by the opposite in the capital account, dragging the overall payments balance to a $5.3 billion deficit from a $54 million surplus over the same months. No wonder the Thai baht depreciation accelerated in June. 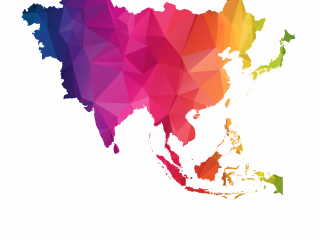 While some in the markets are anticipating that the Bank of Thailand will start tightening monetary policy this year to support the currency, the authorities have been signalling their preference for stable policy. We continue to expect no change to the 1.5% BoT policy interest rate this year. Firmer growth is positive for the THB but a weakening external payments position is negative. While recent USD/THB stability around 33.3 undermines our confidence in our forecast of the pair trading toward 35.0 by end of the year, we don’t expect the THB to return to its status as an outperformer.